I titled this post “The Enlightening Burger Experience” because that’s what Eureka wrote on its about page. And for all I know, this could be true as Eureka! is known for its beer and its burgers. Except, I didn’t try their burgers. Not for lack of trying–I did go in there with an intent to try one of their burgers, but the issue was that I wasn’t hungry enough. And that I was secretly hoping I could get In-N-Out later that day. Because, let’s be honest, the only way I can see eating a burger as an “enlightening burger experience” is if I spend less than $5 on a double-double and french fries from In-n-Out. But, let’s talk about why we’re actually here, right? The food. I had spent the better half of a week trying to figure out where to go for my first meal since returning to Berkeley. As tempted as I was to eat the cheap fare of the restaurants close to campus that I had grown so fond of as an undergrad, I also wanted to try something new (and more expensive!). Eureka is a relatively new restaurant Downtown Berkeley that offering a wide selection of bar food to accompany their many beer and cocktail choices. But, honestly, I settled for this place because Ippuku was closed. I met up with my friend at 1:30 on a Friday afternoon. The restaurant was (surprisingly!) empty and we were seated right away. A quick glance through the menu and I could guess the vibe of the place–a whimsical take on standard bar fare. Unfortunately, both my friend and I weren’t that hungry so we decided to share a few appetizers instead of ordering Eureka’s self-proclaimed “signature” burgers. We settled on an order of Lollipop Corndogs (above) and Steamers (below). I also ordered a grapefruit cocktail of some sort, but it wasn’t memorable nor worth photographing. Back to the food. 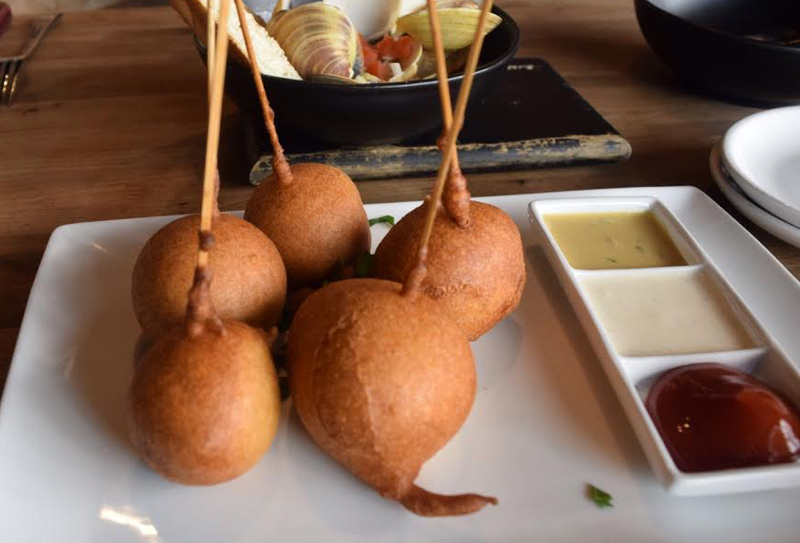 The Lollipop Corndogs were described as “Polish sausage in a sweet corn batter with spicy porter mustard, homemade ketchup, and ranch” and they were delicious! Reminiscent of my childhood, the batter was flavorful and crispy and the sausage was well done. My friend and I enjoyed these “lollipops” a lot! The Steamers, on the other hand were pretty disappointing. 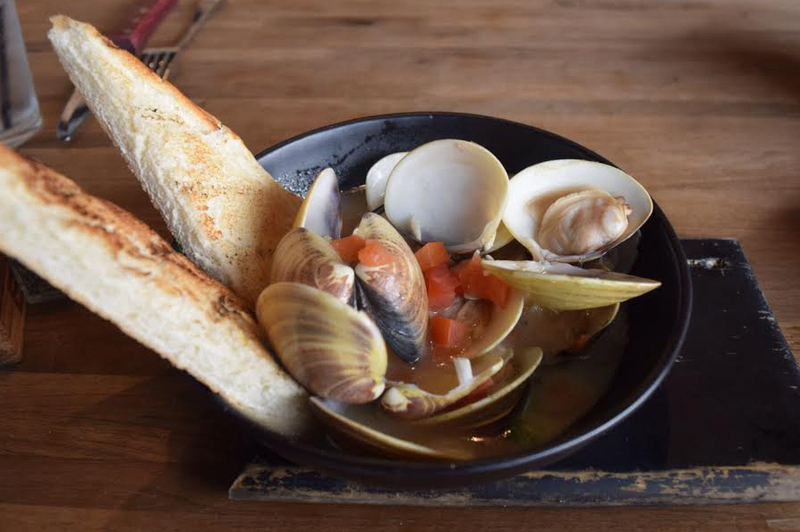 The dish consisted of “Manila clams, garlic, herbs, sherry wine, and grilled ciabatta.” While this is a usually solid dish at most restaurants, the flavors, the texture, and the presentation left much to be desired. Definitely not worth the price tag (though by New York standards, this would be considered a “steal”!). So luckily this meal did actually end in an empty plate. 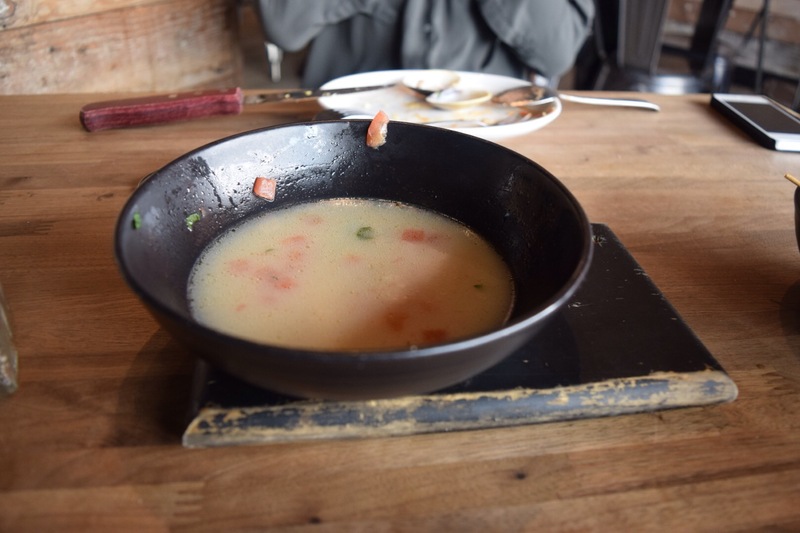 However, one strong dish does not erase the memory of a poorly executed dish and cocktail. I guess the only reason I didn’t feel more upset about the disappointing meal was the fact I had great company, great conversation, and a relatively cheap tab. If given the opportunity, I would come back and probably order the lollipop corndogs again (and finally try one of their signature burgers! ), but I would steer clear their cocktails or steamers. Follow me as I eat my way through New York, the Bay, and wherever else my travels take me.